Section Headings are typically used to add a title to a group of fields. They may also be used to customize your form layout or conditionally hide/show groups of fields. Sections may be collapsible or repeatable. The repeatable option allows users to add a group of fields any number of times. A Section Heading field has the following standard options. Customize the style of your Section Headings by going to 'Formidable' → 'Styles' → 'Section Fields'. The styling in the Headings tab will apply to repeatable and collapsible headings as well. Click on the Section field. Conditionally hide or show sections of your form by adding conditional logic to a Section. When you add conditional logic to a Section Heading, the conditional logic will apply to all fields in that section. This feature is a great time-saver because you only need to add conditional logic to the Section Heading and not to every field in the section. If you do not want the Section Heading to be visible in your form, set the Label Position to hidden or none. 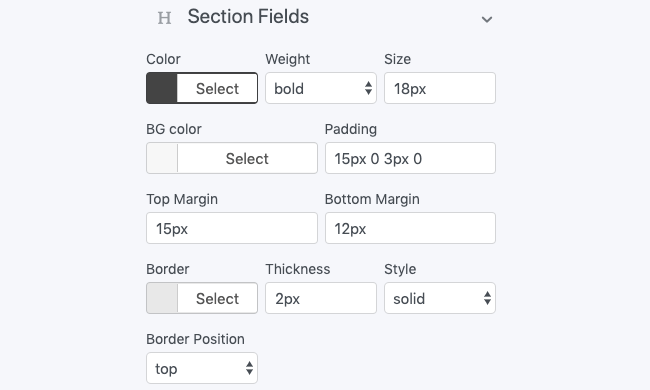 Use Sections to design the layout of your form. 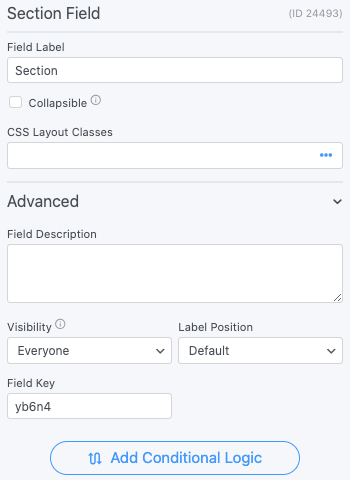 When you add a CSS layout class to a Section field, the class will apply to all fields in that section. You can also add styling to individual fields in the Section; just insert the class into the field's 'CSS layout classes' box. Section Headings provide a faster and easier way of putting your form into columns. If you want a two column form, for example, you only need to add CSS layout classes to two sections, rather than adding a class to every field in the column. If you want to use a Section for styling purposes, but you do not want the Section Heading text to be visible in your form, set the 'Label Position' to hidden or none.